The Surface line has had an interesting few years. Released alongside Windows 8, it was supposed to show off what Windows 8 was meant for: carrying a tablet but having the power of the PC. Unfortunately, its greatest strength was also its greatest weakness: the OS. The early bugs and performance issues as well as the lack of 1st-party app support really held back the Surface line, particularly the Surface and Surface 2. However, the Surface Pro line with Core i3, i5, and l7 variations helped to keep the line alive. I’ll admit I’ve always wanted a Surface-like device so that I can run Steam and Adobe Lightroom. With Microsoft retiring Windows RT, they finally managed to make a device that, on paper, manages to do what they originally advertised: laptop power in a tablet form. The Surface 3 has a 10.8-inch screen with a 1920x 1280. The screen is great and gets decently bright, and barely readable in bright sunlight. Because of the way the glass is setup to allow for the Surface Pen, the glare is minimal. However, this will also depend on the screen protector you apply as well. There is also a capacitive “Windows button” on the right that switches between the Metro UI and the last program you have active. Overall, the package will do things most consumer tablets can do. On the “top”, you have the power button and the volume rockers and on the “right” are all the ports: a microSD port, USB 3.0, a micro USB 2.0 port, and a 3.5 mm dual-input port. It still retains the Surface 2’s kickstand in the back with only 3 angles usable. There are 2 basic models for the Surface 3, the 64-GB model with 2 GB of RAM and the 128-GB model with 4-GB of RAM. Both have an Intel Atom-M Quad-core chip clocking around 1.6 Ghz. Microsoft claims that it gives around the same performance as the i3 chip, the drop in performance not only extends to CPU-intensive tasks but also to Hard Drive Read/Write speeds. The fact is that the “Solid State Drive” is actually eMMC and not SATA that most consumers think of when they hear “Solid State Drive”. It basically has same technology as the ones used on phones and tablets, which still isn’t as fast as most internal Hard Drives these days. Expect slower install times and chugging during intensive CPU tasks, though I don’t notice any slowdown with basic internet and media consumption like higher-end Android and Apple tablets. Let’s face it, if you wanted a basic tablet, there are many others that are cheaper and run just as well on either the older Baytrail or the new M Atom chips. What you’re wondering is how well it handles full PC programs. Currently, I have Chrome, Steam (and a few games), and Lightroom running on it. Chrome and Steam work fine, though neither are touch-optimized and you might have trouble “clicking” through their menus using touch. As for gaming, I’ve managed to get Portal, League of Legends, KOTOR, and Civilization 5 to run adequately on the lowest settings. It won’t be the smoothest gameplay (you can get around 30fps for games that are a few years old on the lowest settings). However, it does support game streaming from Steam or Xbox One if you have the requisite hardware and software. I’ve seen YouTube videos of people playing Mass Effect 2 on their Surface with an XBox 360 Controller attached. The bottom line, it is more than a match for most daily tasks, however the more intensive activities might not hold up as well. Now for you photographers, I’ve run both Picasa 3 and Lightroom 5 (no, I don’t have LR 6 or Adobe Creative Cloud). They work fine, though there is some noticeable stutter when loading the preview images. Importing large amounts of RAW files is slow thanks to the eMMC storage on the device but once the files are loaded, the previews only lag somewhat even from 40 MegaPixel files. It’s definitely good enough to view in LightRoom environment and you can do workflow and some light editing. Unfortunately neither programs are touch optimized so you will have trouble with fine-tuning without a keyboard and mouse. Definitely not a primary machine for editing, but if you’re travelling or at the shoot, it works fine. However, if you’re going to do any sort of video editing….good luck, get a real laptop. 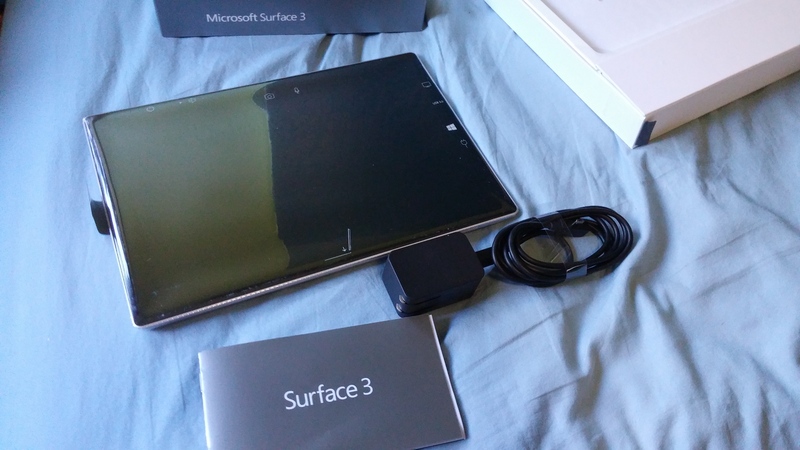 I did consider getting the i5 version of the Surface Pro 3. Sure, I can afford an $800 device (the 128 GB model of the Surface 3 is $600). However, the 12-inch screen is harder to carry around and hold one-handed. The Surface 3 is smaller and lighter, but of course the Pro 3 has superior processors and read/write speeds along with larger build-in storage around the $1000 price mark. You can offset this with a microSD card, safely adding another 128 GB of storage. Unfortunately the Surface Pro 3 does have the all-angle kickstand while the Surface 3 only gets 3. The controversial change was how the devices are charged. The Surface Pro 3 uses a proprietary charger but the Surface regressed to a micro USB 2.0 port. While slower to charge, it is a blessing in disguise as, wIth an OTG adapter, you also gain an extra 2.0 port for things like Mice, Keyboard, external storage, etc. Also, with the micro USB port, you can use any USB batteries you use for your phones, though charge rate and additional on time depends on the battery. Overall, I gave up power (and higher cost) for portability. Which device you get will ultimately depend on what you are using it for. Just remember that the Pro series also have vent ports around the tablet since the i3, i5, and i7 chips all require a fan to cool whereas the Atoms are low-powered and fan-less. Surface 3 (Pro) Pen: While it requires a bluetooth connection (and a AAAA battery along with 2 x 319 cell batteries) it is very accurate and with one “pen click” will automatically open OneNote for instant notations. It has 250 levels of pressure sensitivity, making it a decent artist platform as well. Surface 3 Type Cover: Skip, it’s too pricey for a thin, cramped keyboard for the price. While it is backlit and has moving keys, at $130 as of this posting, it’s way too expensive for doing so little. So Who Might Use This? As a photographer, it’s a nice, portable package with a good screen, adequate power for running Adobe software, and a portable design. Sure the Pro-line has more power, but you’ll be paying for this as well as having to handle increased size and weight. Honestly though, if specs is the main issue, a regular laptop would probably serve you better. However, my concern was being able to carry it with me during a shoot, and the Surface seems more ideal for travel and airports than a regular laptop. For students, it’s a premium product. Even though many hardware manufacturers think that new college students have $800 for computers, I’ve been there and know that it’s all about bang for the buck. If specs matter for rendering, skip. If you like OneNote and it’s ability to record your lecturer talking while taking notes on your PDF slides your teacher will give you beforehand, it’s actually a recommend if you have the budget. You will need the pen and some sort of keyboard. Again, I can’t recommend the touch cover, but the pen should be good for note taking and if you’re doing heavy duty typing, you’ll either have a cheap USB keyboard and USB hub or using a better quality bluetooth keyboard. For the average user, it really depends on what you’re looking for. If you travel a lot, it could be worth a look if you need full Windows programs on the go. It is a very nice, portable package and quite powerful for its size. If you’re just using it to check your email and watch media, you can skip it for a smaller and cheaper Windows 8 tablet. However, if you want to do work like typing, drawing, or even light photo editing, the Surface has that and will run your PC software as well. As it stands, the Surface 3 occupies the weird void between high end tablets and low-end laptops has the strengths and weaknesses of both while creating more problems with itself. If it can get closer to the Surface Pro 3… perhaps this will be the “Tablet that Replaces Laptops”. In the mean time, it’s a niche product and your milage will depend on how intense your full PC programs are. ~ by BlizzardTerrak on August 17, 2015. 10 Years After – Is It Wrong to do Paid Shoots at Conventions?